This last summer we had two separate families — with a total of 6 kids — visiting at the same time. Now being one who bonds best with others thru sports, I knew I had to act swiftly and take the lead on a group activity, and I suspected it would have to be something new for everyone because doing something we would all be "comfortable doing" meant we'd be sentenced to a day of the dreaded going out to lunch and window-shopping in town, a real default for everyone —especially kids with energy to burn and a deep sense of discovery! Not to mention my own selfish reasons. Left to right: Noah, Holland, Natasha & Henry. They not only learned fast, but also had a great time. My arsenal for persuasion was simple but strong: a few Windsurfer boards; a couple SUP paddles; SPF 30, and a quiet sandy beach. Once at the beach, the kids were corralled and I went through the basics of Stand Up Paddling. They listened with interest, and after some initial hesitation, most of them were off on their own independent way. Just like that! 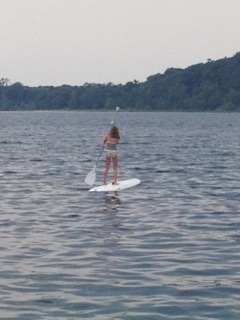 I was impressed with how quickly they were able to stand up, balance, and start paddling. A few falls here and there, no big deal. Especially impressive were the kids that were sharing a board, they had to figure out how to coordinate paddling between themselves while balancing together on the board. They were laughing and chattering amongst themselves all the while. They were fearless. And that's what stuck me most, they were so busy having fun, there was no fear of learning something new, and no shame in falling. It was wonderful to witness. As we continued to watch the fun, and of course some drama unfold between the kids, I couldn't help but reflect upon the adults I'd taught to SUP over the past summers. These kids were by far the quickest adapters I had ever had as students. I wondered why teaching (some) adults was generally more involved and took longer? How come it took adults longer to get their "legs" than kids? I know there's many logical reasons, like kids have a lower center of gravity, and that some adults have physical limitations, but I also believe us "older kids" might be too focused on not falling. And sometimes we just forget —or have forgotten how— to have fun while learning a new skill. Or for that matter learning anything new at all. It is easier said than done. And besides we don't want to run around with the sheer abandonment of a child, we would get hurt. But still, watching the kids was a great reminder not to lose my sense of humor. And also to enjoy the challenge of taking on something new, whatever it may be. My mother always taught us kids to not be afraid of falling. (She also said that a glass of wine at lunch helps you ski better in the afternoon. In fact we had a saying when we skied together, "if you don't fall you're not trying", or as we've often modified it: "if you don't fall you didn't have enough wine with lunch!"). I believe Mom was right-on about trying something new and trying something more difficult. Get outside your comfort zone. These kids reminded me to not forget to laugh when I fall (into the water of course! ); it makes getting up and trying again a lot more fun.